The Noritake Company produced and exported thousands of items in hundreds of designs to the United State between 1921-1935. They had a design office in New York City where current design sources would be used to send ideas to Japan for the Noritake decorators to use. One of the most highly collected periods of Noritake production is from the 1921 - 1935 Art Deco period. They are renowed worldwide for their dinnerware but had a whole division focused on what was then called "fancyware", items for household consumption decorated artistically. Though very reasonable in price when first sold, they are now collected by both collectors in the Western world as well as in Japan. This triangular lobed bowl measures 7 inches in diameter. It stands 1 3/4 inches tall. It has three tab handles. The entire rim of the bowl is painted black. The large central cluster of oak leaves and acorns is placed asymmetrically on the plate, a revolutionary idea at the time. Another Art Deco common feature was the stylization of nature. 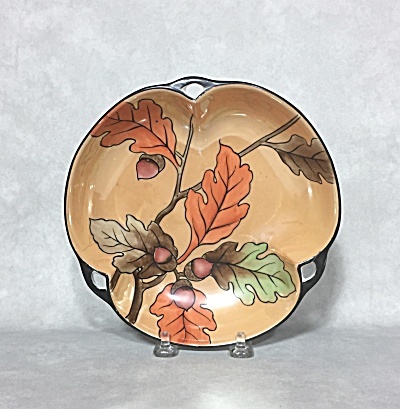 The acorns and leaves are NOT painted in a realistic manner but are abstract and stylized. Noritake is well known for its luster glazes, the most common of which is tan luster. Their less common luster glazes are gold, silver, green, pearl, and yellow luster (also spelled lustre sometimes). This bowl has only tan luster on it but it uses scarce colors of orange in the paint. It is in excellent vintage condition. The green Noritake Wreath mark indicates production between 1921-1925. Later the mark was in red. Add it to your Art Deco or Noritake Art Deco collection today.